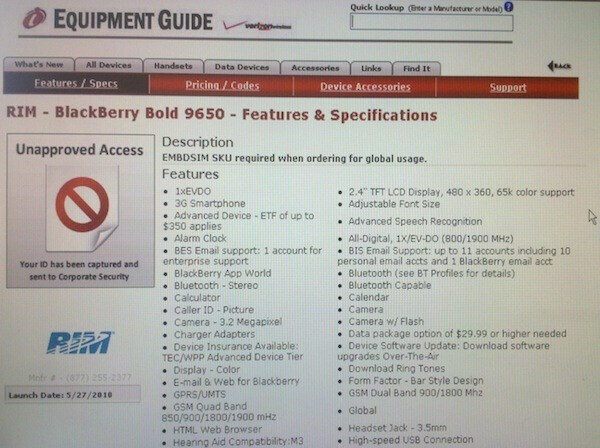 With each trickle of news regarding the BlackBerry Bold 9650 for Verizon starting to seep out even more, additional specs about the handset have been revealed through Verizon's own Equipment Guide. Thanks to the leaked screenshot, fingers are pointing to May 27 as its rumored launch date and the confirms some of its specs– such as a 3.2-megapixel camera, GPRS/UMTS, 1xEVDO/3G, quad-band GSM connectivity, 2.4” TFT LCD display with a resolution of 480 x 360 & support for 65k colors, and Bluetooth. Although it's expected for Verizon to roll out some new devices that are truly incredible in their own regard, the BlackBerry Bold 9650 is now looking to wait a bit longer before it can be available for customers. You never know though, Verizon could easily bump up that date to include it with all the upcoming festivities that are expected to happen shortly. I hope it comes out sooner than that. lol unapproved access. someone is getting in twouble!!! Maybe it's legit and just a marketing ploy from Verizon, if people think the BB is out that far they may choose to buy the droid incredible instead of wait. Either way, this phone seems like it might be outdated before it ever hits VZW.